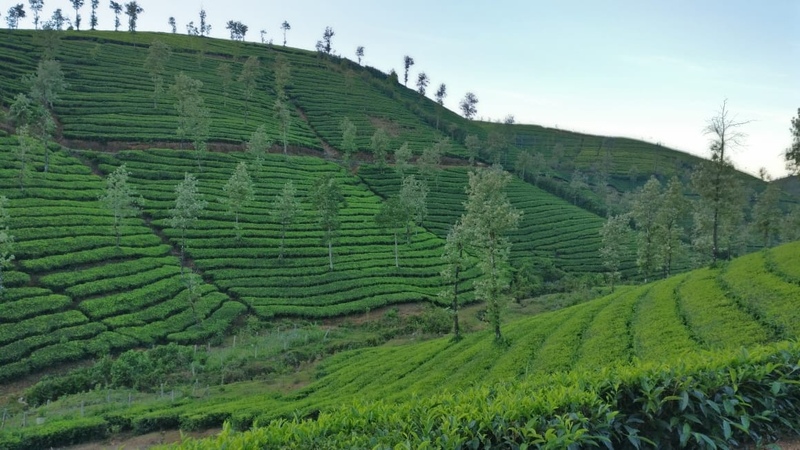 Getting to the hills of Vagamon was quite the journey! On Thursday afternoon we took a 2 hour flight from Mumbai to Kochi where we found a hotel for the night. The cab delivered us to the front desk – literally – he drove up the ramp into the lobby and dropped us right at the desk! We dropped off our gear and set out to find dinner in town, walking through the quiet beautiful streets of Kochi. We were on the search for “authentic” South Indian food. That was the theme of the weekend – they wanted me to have authentic experiences, even going as far as getting me to do things by telling me it was authentic 😉 We found an excellent dinner spot where I was able to try all sorts of delicious foods, which was the kickoff to my weekend of eating way more than my body was accustomed to! But how could I turn it down? (I tried sometimes, but wasn’t allowed haha). The next morning we left for Decathlon where we check in and acquire our bib. This is where we met up with the rest of the UTRC boys and took a short walk to a breakfast spot. 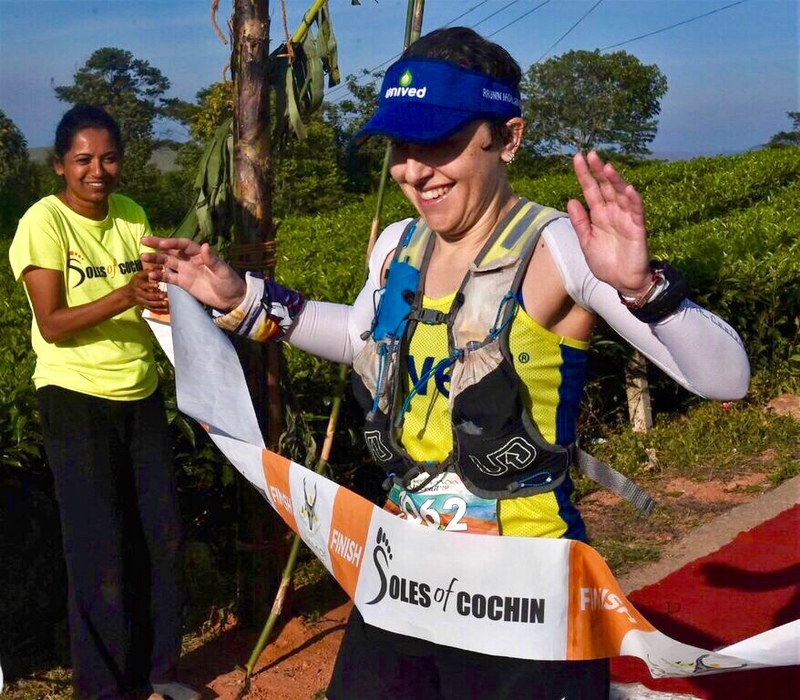 I tried more new foods – delicious Appams – served by a man wearing soccer cleats 😉 A sporting goods store is a perfect spot to wait around for bus transport so we hung out at Decathlon for a while and before I knew it they were serving the racers lunch. Not hungry at all, I was informed that I would only have one more chance to eat that day so I better fill up. I rallied and got it done. 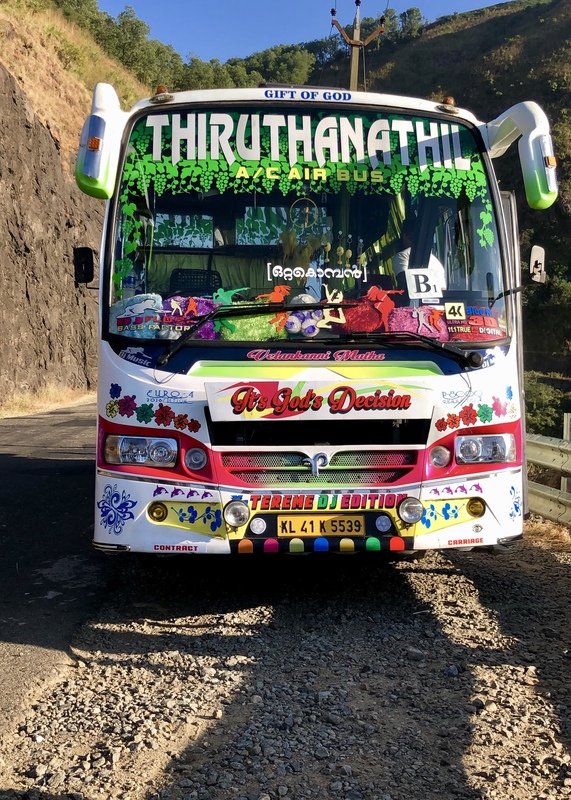 After lunch we boarded the party bus (yes, it even had a disco ball) and we began our 3 ½ hour drive to Vagamon. 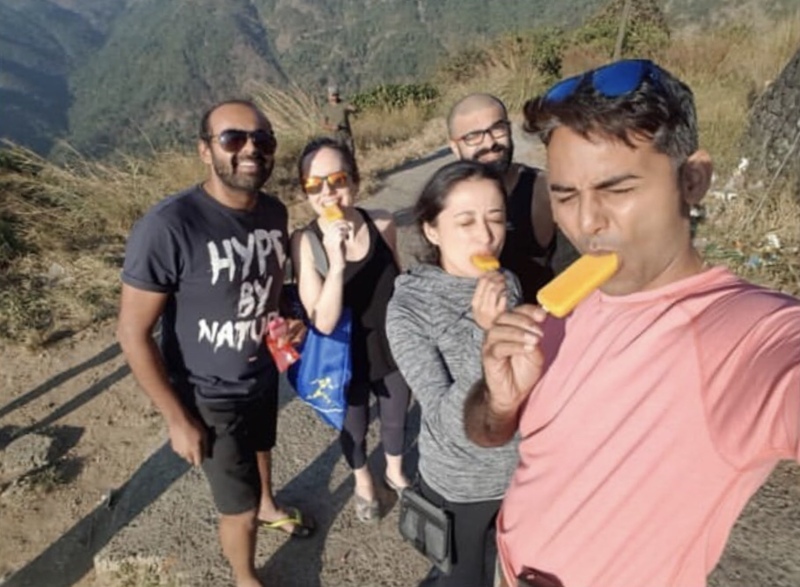 All aboard the party bus to Vagamon! The last hour + we climbed the narrow, winding roads that showcased the beautiful landscapes we would be running the next day. We made one pit stop on the climb at a vista so we could enjoy the view, and a vegan mango sorbet from the ice cream truck. Once we arrived at our cottages and checked in I had to quickly prepare my drop bag as we were soon leaving for the race briefing and pre-race dinner. The cottages sat high up on the hills and were quite cozy. Each cottage had 2 rooms and I was supposed to share my room with another 90k racer but she did not show so I had the room to myself. 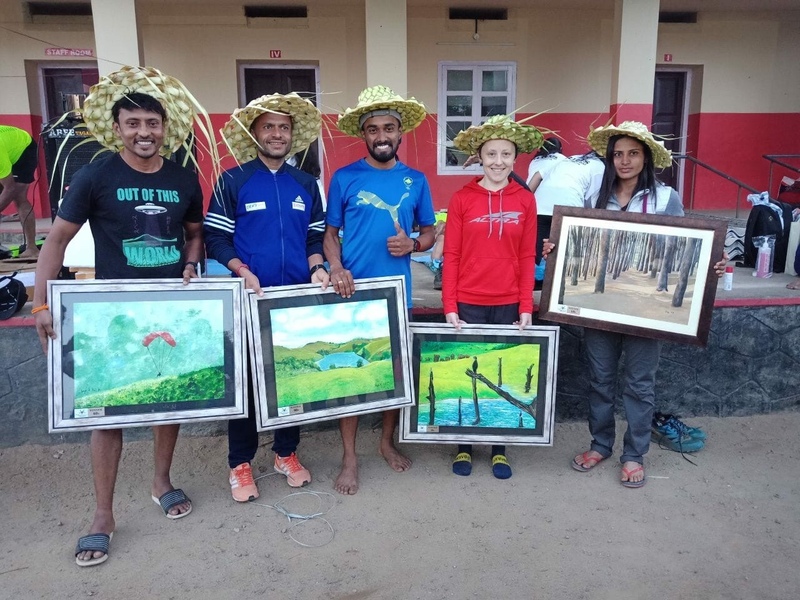 I shared the cottage with Anand, the race director for Malnad Ultra, and another gentleman. 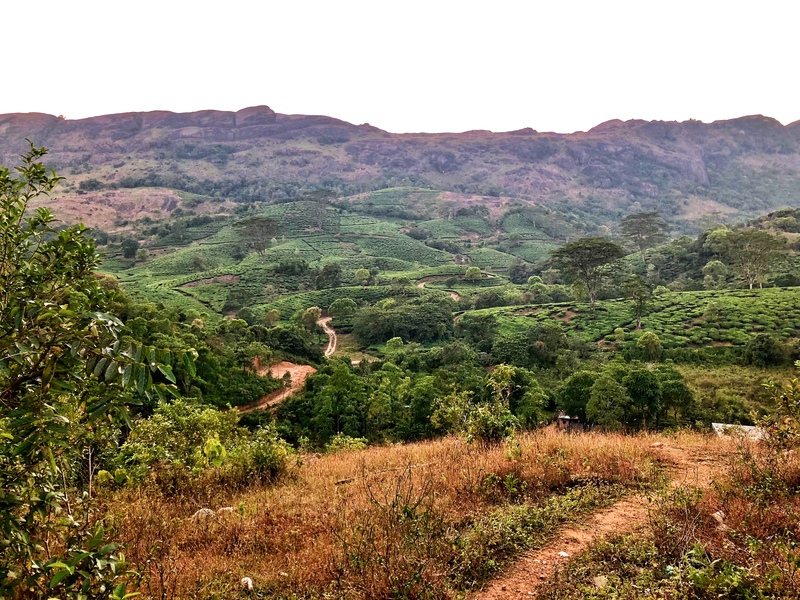 We decided to walk down the hill to the race briefing and it was nice to stretch out the legs and soak in the views of the beautiful tea estates. The race briefing was perfectly succinct. Then I loaded up (once again) on rice and dal before we walked back up the hill to turn in for the night. I organized and laid out my race day gear before getting about 4 interrupted hours of anxiety-laden sleep. I was worried about the heat – that was all. The 3 a.m. alarm went off and I started my race morning prep. I had a cup of dry oatmeal with a splash of room temperature bottled water (you gotta do what you gotta do) and a packet of almond butter. The bus was ready to leave promptly at 4 a.m. as we descended into the valley snatching up other racers along the way. A gentleman sat next to me and as we introduced ourselves he said “oh, you’re THE Laura. You’re supposed to win today!” No pressure. We arrived at the race start and it was dark and cold. I was definitely happy about the cold start! I checked my bag, snapped some selfies with Rahul, then calmly made my way to the start line. Most ultras I race have that quiet, nervous tension at the start line. This one did not! So much energy and excitement – I couldn’t help but smile. They sent us off into the darkness and the leaders took off at a good clip. Not knowing any of these runners I did not know what to expect and how the race would play out. I wanted to stay close to the leaders to get a feel for what would unfold so I tucked into 4th position. The trail wasn’t too tricky but there were plenty of rocks and ruts to throw you off with only the light from your headlamp. Within the first mile one of the guys in front of me took a serious ankle turn which caused him to stop and walk. Yikes! Within the second mile the next guy did the same. Okay, let’s focus and not do that. I was dancing the line of wanting to push these early miles to cover as much ground as I could before the heat set in and being conservative over trails in the dark. I now chose to lean towards conservative. I was sitting in 2nd and the leader was running strong pretty far ahead. As we were climbing I saw a turn off onto a trail that he had missed. I stopped and called out to him. When he turned around I pointed to the trail but he turned back around and continued. I was now in the lead and will admit I wasn’t very confident running out front in the dark. However as I climbed into a clearing I was overwhelmed by the quiet, calm beauty of running under the stars and moon with just my beam of light – I felt so much appreciation in that moment. 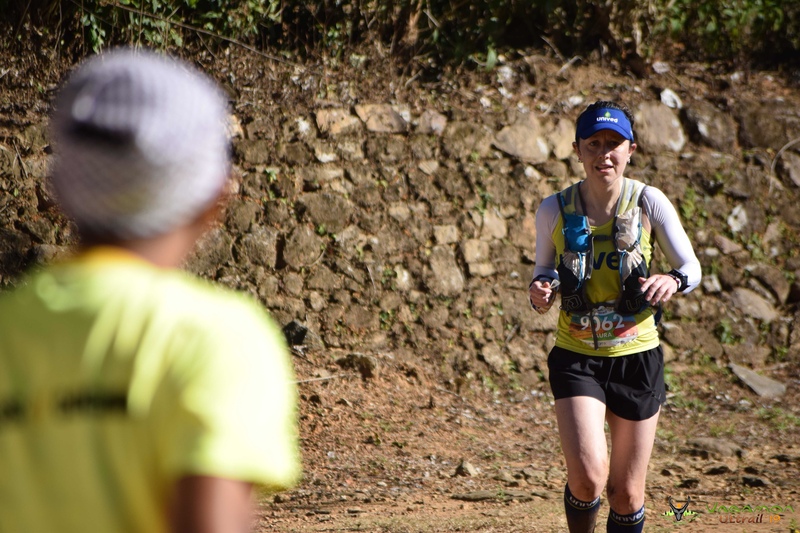 I didn’t hold the lead for too long before a few runners passed – one of which was the leader who I was happy to see found his way. He thanked me for warning him. Still trying to run conservatively on the trail sections I soon lost contact with them and twice went off course. However that wasn’t due to improper marking – I simply didn’t pay attention. And because the course was so well-marked I was able to quickly realize and correct my error. I will admit that the competitor in me was a little bummed to fall off the leaders that early in the race, so it was time to adjust my mindset. Do not focus on placement. Do not focus on time. Respect your current fitness level. Soak up everything this experience has to offer. As the sun began to rise the horizon was blanketed in beautiful pink and purple hues – simply stunning! I was excited to finally start seeing the landscape. Villagers were starting their day and some were out sharing the trails. It was nice to start seeing people and my smiles and greetings were happily returned. At the 30k mark we had access to our drop bags where I was swapping out fresh bottles of RRUNN During Hydration Mix and RRUNN Endurance Gels. There were plenty of volunteers ready to cater to your every need and they were very insistent that I stop for a hot breakfast. I politely declined each time and was quickly back out onto the trails. Soon after that the two leaders came into sight – they were running together. I would be lying if I told you the competitive runner in me didn’t come back. I caught up to them around mile 21 and we all ran together for a bit and chatted. One of them kept calling me Super Lady 🙂 They were running strong and I was surprised to have caught up with them at this stage in the race. Throughout the race there were many cows on the course. I obviously had a conversation with each one of them. We reached a spot of high cow traffic and just as I was scoping out how to maneuver around them I took my only spill of the day – I tripped on a rock and went down hard – startling the cows as they quickly moooo-ved out of my way (sorry I couldn’t resist). Santhosh and Sunil kindly stopped to make sure I was okay and then we carried on. 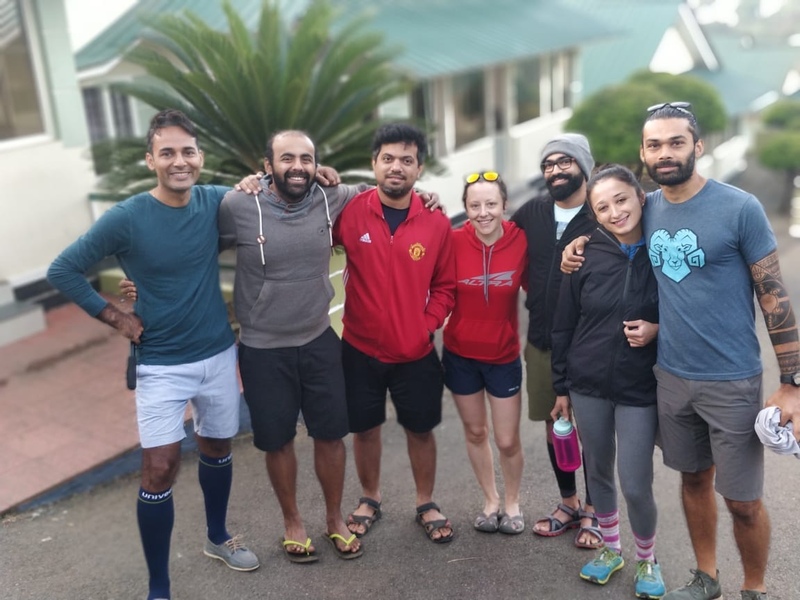 It was great running with them and part of me wanted to stay and enjoy their company but I also really wanted to run my own race so soon after I was out in the lead on my own. The next major chunk of this race is mostly a blur to me. We spent a lot of time in the heat of the day directly exposed to the sun and I was quickly melting. I do still remember all of the scenery, which is where I fail to properly describe the beauty of this course. I also remember suddenly emerging on the ridge at the highest point of the race and yelling out an expletive. It was so cool! Running along the ridge was also a welcome break as the winds were high. I kept spreading my arms like wings – letting the breeze hit my arm coolers for some relief. At each aid station I would douse myself with water to cool off. I cannot tell you how many times throughout the day I went through my mental safety check – reciting my name, address and phone number. I did this so many times I was afraid I was reciting it out of habit, so I switched to my family members’ full names and birthdays. I even threw in some work passwords to really challenge the brain 😉 As a heat stroke survivor I have learned that if my mind gets fuzzy I’m in trouble. So even if I was a little too obsessive with checking in on my brain it gave me the reassurance that I was doing okay. Somewhere after the 50k mark Santhosh and Sunil caught up to me when I was at a low point. I didn’t even hear them coming. They asked if I was okay and I assured them I was just slowing down. I kept them in sight for a little longer but soon they were gone and I was sure I would not see them again. 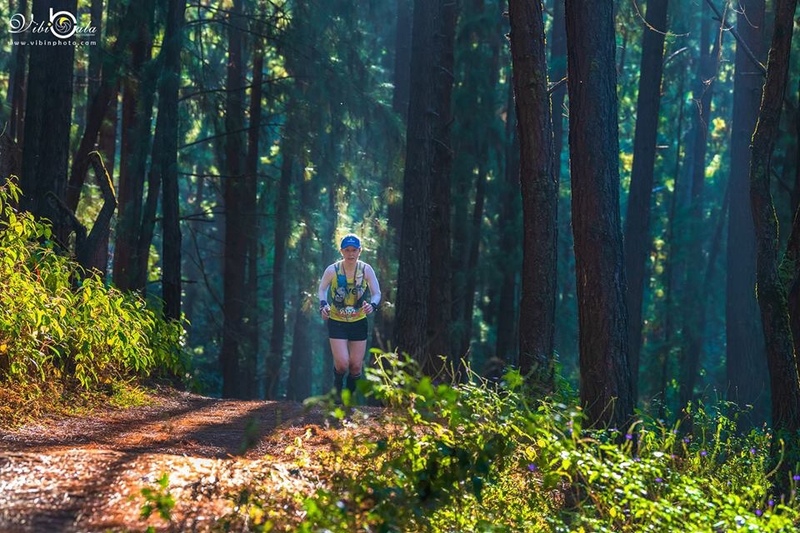 Pine Forest was a favorite for many of the runners but not as much for me as it was the one section that reminded me of running in the states. However I was happy to have some relief from the sun. On our return trip this area was now bustling with activity. As I ran through the small, crowded market two nuns stopped me and one asked “where are you FROM? ?” with such curiosity. As I hit the forest trail it started a stream of cheers. Each person was yelling something down the line and putting their hand out for a high five – from children to older women. It was fun and their energy fueled me. In the excitement I nearly blew by the turn but luckily a runner coming the other way yelled out to correct me. I saw Santhosh and Sunil up ahead on the climb but even as I was guzzling my Thums Up I did not see myself reeling them back in. Once I hit the 60k mark my legs were in full-on protest. I also don’t remember exactly when my watch battery gave up on me, but that added to my feelings of despair. By this point I knew I was not getting anywhere near my goal of sub-10 hours so it wasn’t the worst thing in the world to not be reminded of the time. And with the ample aid stations which always provided mileage updates it was easy to know where I was on the course. I was living aid station to aid station – looking forward to dousing myself with water, drinking some cold RRUNN Watermelon, and treating myself to orange slices. I came upon an aid station where I was greeted with “sit down and we’ll make you an omelette!” I informed them I was vegan so no omelette for me, and also that I wasn’t allowed to sit 😉 They told me I at least had to have “special drink”. I did not know what this was but figured why not, and took a shot from a glass. A volunteer offered to pour water on me and I wasn’t turning that down. 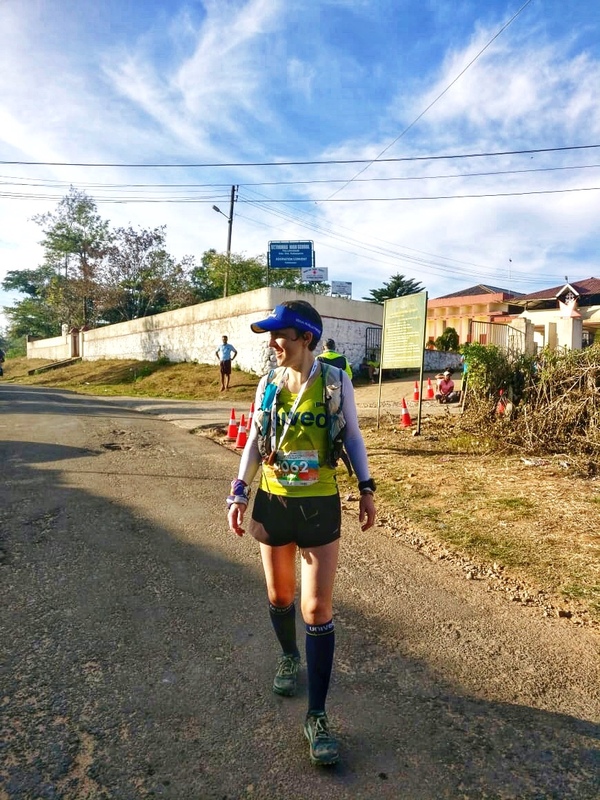 He poured a huge bottle over my head and I left that aid station with renewed energy from the special drink and the cold shower. Running back through the villages I was a popular attraction. The women would stare intently into my eyes as I passed. I ran by a group of about 10 women sitting along a wall – conversation stopped and all heads turned to me as I passed. I then heard laughter and as I turned around one of them was taking a picture of me. Children were out playing and were very enthusiastic. They would see me and run into their houses to alert others to come outside. Lots of cheers, smiling faces, and high fives. I was very excited to see the final aid station which meant 5k left to run. When I arrived one volunteer told me it had been so long since they last saw me. In my tired daze I thought he was referring to how painfully slow I was now moving. He reminded me that they last saw me at 5:30 in the morning. Oh yeah, they were my first aid station of the day as well as my last. After what felt like the longest 5k ever, the finish line came into sight and I was ecstatic to complete my race as I broke the tape among a crew of happy volunteers. I quickly found Santhosh and Sunil and we all congratulated each other on strong performances (they finished together for 1st place). Monica was there to welcome me and I also found Amit who finished 7th (!) in the 60k, along with Arjun. Ashish finished soon after me and before too long Sanjay finished his race. 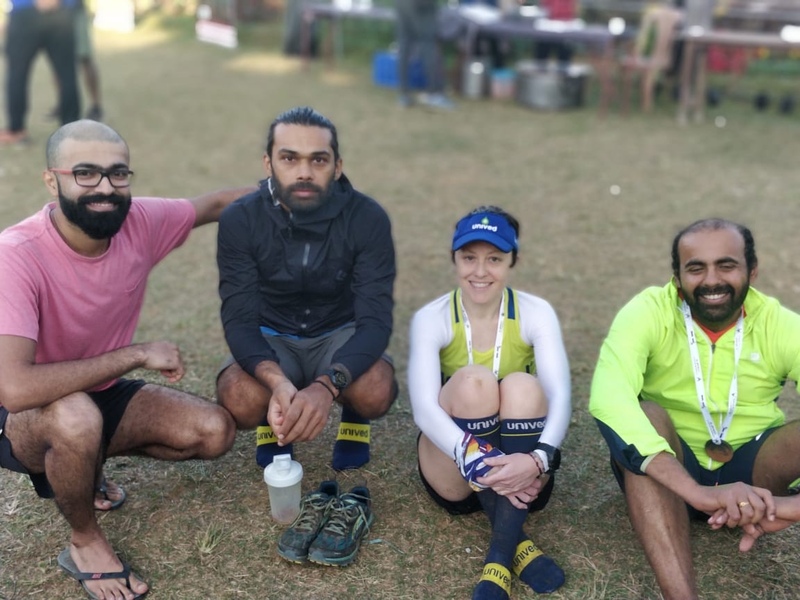 I saw the physio for a wonderful post-race massage and we all sat around enjoying post-race food and recounting our days on the trails while waiting for our team photographer/videographer Rahul, who was also running the 90k. I was very excited to test a new line of Unived RRUNN Elite products on race day. I won’t give away too much yet…you will definitely hear more from me once the products are launched. It’s great to have the trust in a company to try new products for the first time on race day and have them exceed your expectations! Unived continues to create top nutritional products and I’ll be very excited to share them all with you. The flavors…okay that’s enough teasing for now. Throughout the race I drank 6 bottles of RRUNN Elite Electrolyte Mix and consumed 1 RRUNN Elite Gel per hour. I did not experience any stomach issues and felt properly fueled throughout the day. I supplemented this with some orange slices and water at aid stations and also popped a few RRUNN Caffeinated Salt Caps to help me battle the heat. I also enjoyed a few cups of the RRUNN Watermelon During Mix that was being served at aid stations because who doesn’t want a refreshing watermelon drink during a hot race? 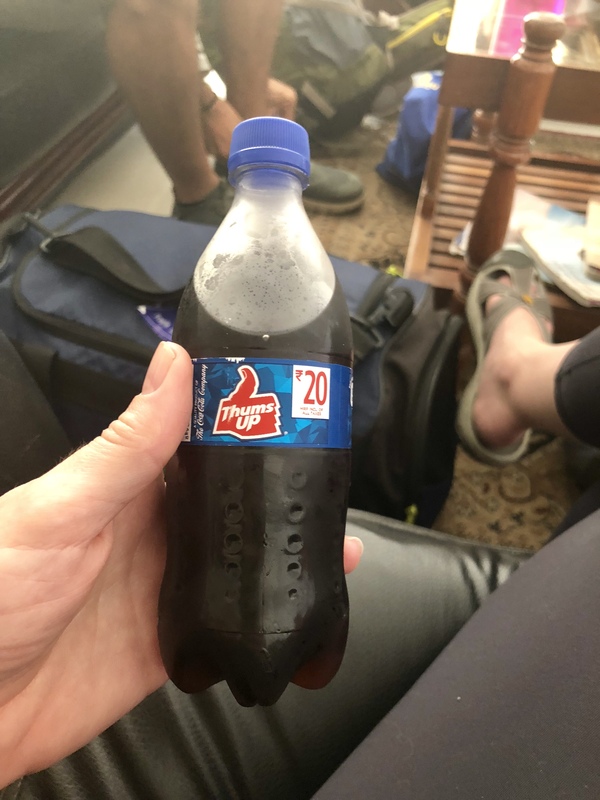 And let’s not forget the Thums Up! If you’re interested in trying any Unived nutrition products or performance gear you can use my code LAURA15 to receive 15% off at checkout! Leading up to the race I went back and forth between my 2 favorites – Altra King MT’s and the Altra Superior’s. I chose the light and fast Superior as there weren’t too many technical or rocky sections. I also got to debut the Unived Race & Recovery socks which will definitely be my new go-to sock! The material was very soft and comfortable and I’m a big fan of the arch compression. They feature 3D dots along the sole of the sock as well as the achilles and this technology really added comfort while preventing fatigue in the feet. The socks got wet, went through mud, and endured the heat, yet I had zero blisters or hot spots. You’ll see pictures of me post-race still wearing the socks because even after almost 12 hours on the trails they felt good! Under my Unived Performance Air 1.0 Singlet (definitely feels like air!) I wore some DeSoto Cool Wings to add protection from the sun and heat. I went with my trusty Ultimate Direction Race Vest – lightweight as there’s not much to it with ample pockets for 1 liter of fluid and a stash of gels. I was also excited to sport the new Unived visor – I’m just not a trucker hat fan – visors for life! Overall my comeback race was a success. 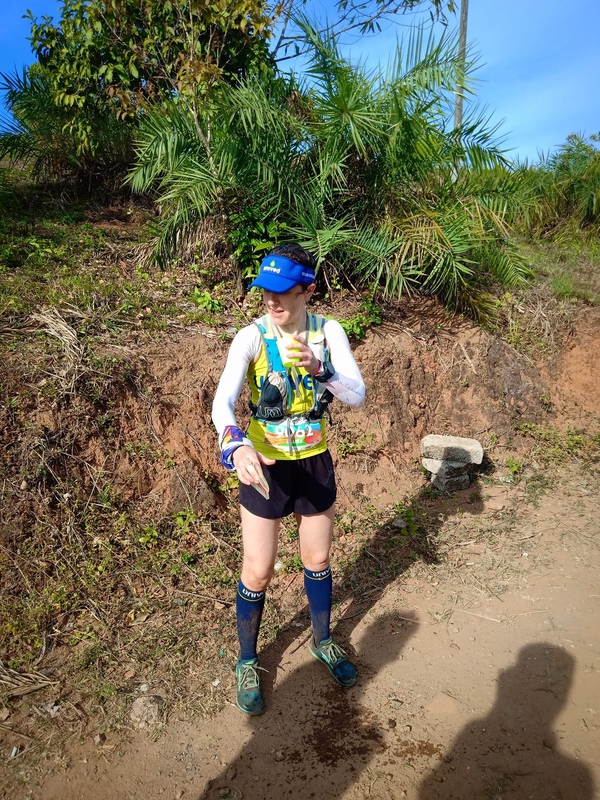 2018 was a tough year and it was hard to safely build the mileage I needed to compete at 90k in the short amount of time I had available. Although this lack of volume was the main contributor to not meeting my goals on race day, I was still able to run, race, and thoroughly enjoy an amazing day on the trails! With the time that has passed since the race I recovered quickly and by respecting my current fitness level I am no worse for the wear! This has deepened the hunger in me for a strong 2019. A thank you is not enough to express my gratitude to my Unived family. They made this race possible for me. They helped me through this injury – not only nutritionally but through their emotional support and commitment. They were also the most gracious hosts from the time I landed in India until I had to say some hard goodbyes (more like see you soon!) Also for making sure I had everything I needed on race day from nutrition to gear. I am beyond grateful to continue our partnership in 2019. Thank you to Altra for believing in me after a season of injury. I am humbled to be a part of the Altra Red Team again in 2019. Finally, thank you to all of you who stood by me last year. It wasn’t an easy one, but when you have a strong support system of family and friends who make you laugh when you’re feeling down or give you tough love when you need it – that makes all the difference. Looking ahead it’s now time to start focusing on my next big race of the year – Comrades! There will likely be a race or two in the lineup before then, and potentially another exciting trip (more coming soon). Happy & Healthy training to you all! 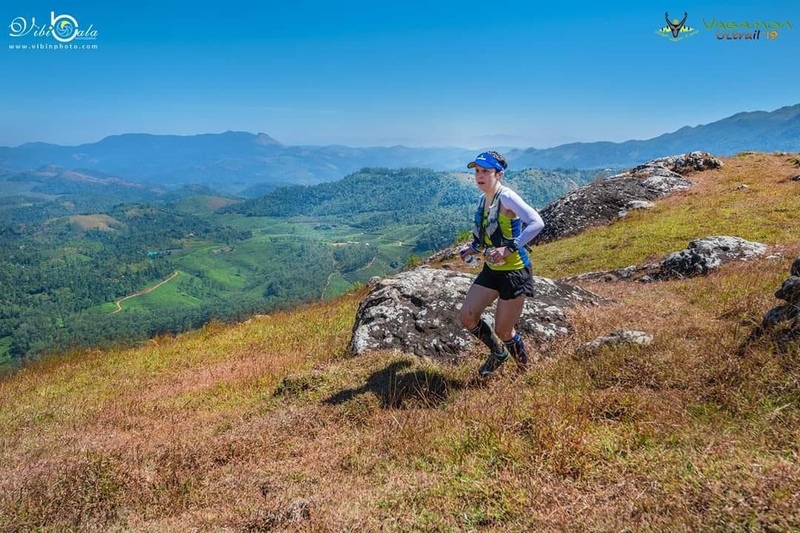 This entry was posted in Altra Running, race, race report, trail race, trail running, ultra race, ultra running, Unived and tagged Altra, Altra Red Team, Altra Superior, race, race report, RRUNN, Soles of Cochin, trail racing, trail running, Ultimate Direction, ultra racing, ultrarunning, Unived, Unived Athlete, Unived Family, Unived Trail Runners Club, UTRC, Vagamon Ultrail, Vagamon Ultrail 90k by lljkline. Bookmark the permalink. I just went through the Vagamon trails all over again. You are amazing and the time we shared here was so much fun. Already looking forward to see you soon. And Wishing you a Strong, Fast and Healthy year ahead.